Juicer can help create engagement at your live event or bring a social component to your lobby by being displayed on-screen. In addition to the summary below, you can view a video walkthrough here. 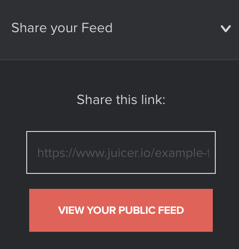 Simply click the "Share your feed" panel of your Juicer dashboard to find the dedicated URL for your Juicer feed. Every Juicer feed across all plan types comes with its own URL, which displays the feed full-screen. Paste this URL into a browser and people can view your feed this way, rather than from a webpage where you've placed your Juicer embed code. Click the "Auto refresh for live events" option within your "Feed Settings" panel (it is the last checkbox listed). This does not mean your feed will update in realtime. Instead, the feed will refresh at your usual update frequency. This is hourly on the "Medium" plan, 10-minutes on the "Large" plan, and can be faster in our Campaign and Enterprise options. The "auto-refresh" feature will require a paid plan to work properly. The benefit of using "auto-refresh" is that you do not need to manually refresh your browser to display the newest posts. It will do so on its own. If your on-screen feed displays a hashtag source, you may want to filter the posts to block unwanted content. Use the "Moderate and Filter" panel of your Juicer dashboard to set this up. More in-depth information about these tools is included in our Help Center. The simplest measure is to enable "Don't allow posts with profanity" and enter any other specific terms into the "Disallow" and "Only allow" fields. Please note that the filtering fields are case sensitive, and terms must be separated by commas for the filter to work properly. Alternatively, you can send all new posts directly into moderation, so you must review and approve posts before they appear. To do so, simply click the "Send all posts to moderation" feature. You can then access new posts from your "Moderated Posts" section as Juicer obtains them, and click "Approve" on posts to allow them through. You can also pin posts to the top of your feed by hovering over them and clicking "Pin", then refreshing your page to see them pinned to the top. New posts will then enter your feed BELOW the pinned posts. This is useful if you want to highlight some specific posts consistently on-screen. If very few people are posting with your hashtag on Twitter or Instagram, the networks may not properly index the posts. As a result, they will not appear automatically in your Juicer feed. Please test your hashtag within Juicer in advance, if possible. As more people use your hashtag, you should have more success displaying the posts in Juicer. Juicer can obtain a certain number of posts for your sources with each refresh. For example, every time your feed updates (such as hourly or every 10 minutes), our software can obtain the most recent 12 posts for any Instagram source, or the most recent 50-100 posts for Twitter sources. If your hashtag is very popular, you will want a higher update frequency for this reason. The social networks will sometimes restrict access to a post within their respective APIs, so we cannot guarantee that all hashtag posts will enter your feed. When this occurs, Juicer is unable to identify the specific reason. Feel free to contact us with any questions using our Intercom platform (the chat window in the lower-right corner of your screen).